Thousands of Worms Are Launching Into Space Soon. You Know...for Science. 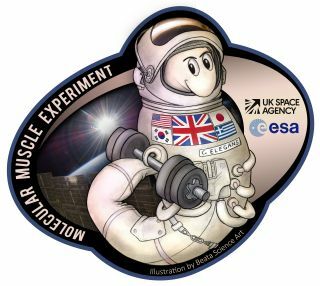 The mission patch for the Molecular Muscle Experiment, which is growing worms on the International Space Station. Worms don't get a whole lot of respect here on Earth, but later this year, thousands of them will take the journey of a lifetime when they head to the International Space Station. That's thanks to a project called the Molecular Muscle Experiment, which is shipping thousands of microscopic worms of the Caenorhabditis elegans species to the orbiting laboratory. The project aims to help scientists better understand how muscle cells grow and develop in space and on Earth. "Worms are, perhaps surprisingly, a very good model for human muscle maintenance," Tim Etheridge, who studies muscle development at the University of Exeter in the United Kingdom and is taking part in the project, said in a statement. The worms will have their own miniature habitat within the space station, traveling up while sealed inside a bag of bacterial food that will allow gases to pass in and out, so the worms don't suffocate. Then, that bag will be incubated aboard the space station for the duration of the experiment. "At the molecular level, both structurally and metabolically, they are highly similar to that of humans, and from a spaceflight specific perspective, they provide a lot of practical advantages," Etheridge said in the statement. "They are very small, quick to grow, cheap and easy to maintain. It makes them good to work with." In fact, the worms grow so fast that the experiment will take only about a week. After the worms develop into adults, they will be frozen for the trip back to labs on Earth for further analysis. Scientists hope that the project will help them pinpoint exactly which compounds are responsible for the serious muscle loss — up to 40 percent of total muscle mass in six months — that astronauts experience in space. And the experiment should have consequences for humans who never leave Earth as well. That's because muscle loss in astronauts plays out pretty much the same way as it does in aging humans on Earth, just faster. Muscle loss itself is also a key challenge for people with muscular dystrophies and diabetes. The worms are scheduled to launch in late November aboard a SpaceX Dragon cargo mission.